If you’re concerned about how Brexit might affect your investments, our team of experts are here to answer some of your commonly asked questions. Is it a good idea to invest now, before Britain leaves the EU? Firstly, we think it’s always best to start investing as soon as you can, rather than trying to find the ‘best’ time. There is plenty of evidence to support the idea that investing your money and leaving it alone (‘time in’ the market) is better than taking it out to avoid turbulence (‘timing’ the market). What tends to happen is some of the market’s best performing days can happen soon after the worst, so by taking your money out, you miss some of the best days to be invested. Secondly, the world’s financial markets have had plenty of time already to process what Brexit means and to plan accordingly, even given the several possible outcomes. We think that any negative reaction to events post 29th March 2019 will be localised to UK-based investments, with perhaps some spill into EU markets, but that the rest of the world’s financial markets will carry on more or less as normal. Based on this belief, we recently adjusted customer plans to increase the balance of overseas investments they contain. This should help lessen the effect of any short-term bumpiness in UK markets that might happen around the time the UK leaves the EU. The most likely outcome is an agreement somewhere between a Soft and Hard Brexit – although no scenario should be ruled out completely. Here’s some of the main possible scenarios. Soft Brexit – The UK leaves the EU but retains some of its existing ties, potentially remaining in the Single Market or Customs Union. A ‘best-case’ scenario for the UK Government would be to carry on benefitting from tariff-free trade, but take back full control of its borders. However the EU has firmly stated that the UK cannot cherry-pick which of the Single Market’s “four freedoms” (people, goods, services and money) it wants. The EU’s stance is, it’s all or nothing. This disagreement is a significant block on progress. Hard Brexit – The UK leaves the Customs Union for both goods and services, potentially leaving Britain without trade agreements with its EU partners and higher tariffs and tougher checks for goods moving between the UK and EU. This has the most potential to create uncertainty and confusion in the days immediately after the 29 March 2019. 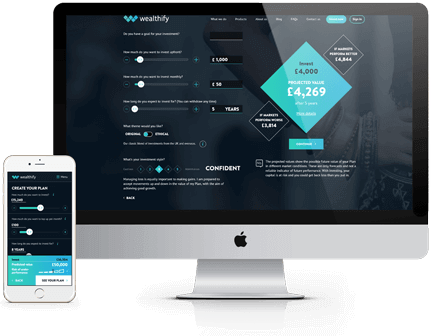 What is Wealthify doing to prepare for Brexit? The main thing to remember is that we think Brexit’s impact is likely to be limited to UK investments and markets, with possible, minor effects on EU markets. We think markets across the wider world will be broadly unaffected. Our approach to investing is to spread your money out across numerous investments and markets worldwide in a process known as ‘diversification’. This means that any one localised event, like Brexit, should have a limited impact on the overall performance of your investments. To provide extra assurance, we recently rebalanced customer plans to even further reduce their reliance on certain UK-based investments, particularly UK property. At the same time we increased the amount of shares customers hold in companies based outside the UK and Europe. What will Wealthify do when Brexit happens? We feel we’ve done everything we can for now, but we’ll carry on watching closely as the situation develops. We’re confident that our plans are suitably balanced with shares and other investments from across the world, so our customers’ money is well spread out and not overly reliant on any particular investment type or market. This means that Brexit, which mainly concerns the UK and the EU, should have a limited impact overall. Being well-prepared means it’s likely that any further action will be minimal, unless the outcome is significantly different from what is expected. However, the benefit of a team of experts managing your investments for you is that, should a shock outcome occur, we’re ready to adjust plans accordingly. How is Brexit going to affect my Wealthify plan? This is unchartered territory for the UK and EU and their markets, so it would be foolish to say anything beyond doubt. We stand by the belief that the best way to prepare against the unknown is to diversify your investments as much as possible, which we do as standard, day after day for our customers. The key thing to remember is to keep calm and carry on investing. Try to avoid the urge to ‘time the market’. Focus on your long-term goals rather than the short-term noise. Investing is a long-term endeavour and the value of your investments will fluctuate, but almost every downturn in history has been followed by a recovery. Past performance is not a reliable indicator of future performance. Please remember the value of your investments can go down as well as up, and you could get back less than invested.